We have to go through a process of adjusting to loss of daylight saving. January in NZ we talked about 8 more hours of daylight and now the evening descends quickly. Now long drawn out twilight in the sub tropics. Basking on the beach, shooting the waves, just lolling about has us taking on what we might have considered as “old folks” hours, eating dinner early, retiring early. We are surrounded by others with the same hours, so it doesn’t seem alien. Another subtle shift towards being elderly? The Gold Coast does have a high percentage of retirees in their population. What are all those other people doing? From Joanne Harris’s Jigs & Reels a section I thought worked well with the broken sleep of being in a tower looking out on the world of Surfer’s Paradise I woke up at two in the morning again, and couldn’t go back to sleep. …so I get up, dressed and went out. .. sometimes I like to walk there and see the lights above the car park and the people moving about inside. They can’t see me looking in, but I can see them… I wonder why they come here so late; perhaps like me they can’t sleep. Perhaps they are night workers, or perhaps they enjoy looking out from those warm yellow windows and imagining someone standing outside. There was a few nights that jittery temperature controls (hot flushes) had me watching the view to see how many others might be doing the same. The sounds of surf invade everything. We encounter the work of the beach sand artist Tony Plant who constructs swirling patterns on the tidal flats, and then photographs the incoming waves eating his work. The ultimate in disposable art. Apparently he has been doing this, ‘temporary interventions and drawings in the landscape’ for 20 years. Local television calls for suggestions for where he can work, I immediately want to suggest out front of the Southern Cross apartments in Burleigh Beach. Tides of Rhyll on Philip Island Victoria. The shop sign doubles as a seagull perch. They only sell fish and Chips, well the choices do extent into Fish sandwich or burger, but neither of these two are printed on the menu. Oh, and you can get beer and wine with your meal; soft drinks, help yourself from the fridge. Our lunch is 2 pieces of Grenadier and chips is $15. 25 cents extra if you want any sauce. 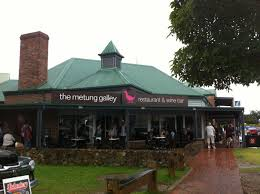 The Metung Gallery, Gippsland Lakes. 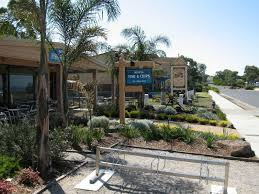 Restaurant with adjacent Fish and Chippery. Run by a bubbly West Australian who is a wealth of information, including telling us how they used to have a café on the other side of the road. But, ‘brought this side because it can’t be built out.’ Serving of Fish and Chips is $16 for two people, includes lemon and tartare sauce. I opt to include an old favorite, the potato cake, or potato scallop, depending on where you come from. A meal in itself, soft and almost mashed inside. The Galley, in typical Gippsland weather – rain! My reviews of this 2014 challenge disappear into a separate journal, I have to pick up the trail when I find the rest of my entries. It’s hard to imagine that these are the only Fish and chip opportunities we had all the way from Melbourne along the southern Victorian coast, and northward up the New South Wales South coast the entire way back to Sydney. But stranger things can happen.